A year ago I decided to do my first MOOC. For those unfamiliar with the term, it has nothing to do with cows; it stands for Massive Open Online Course. I had recently heard about Coursera, a platform where anyone can attend free online courses on a variety of topics from universities all over the world. 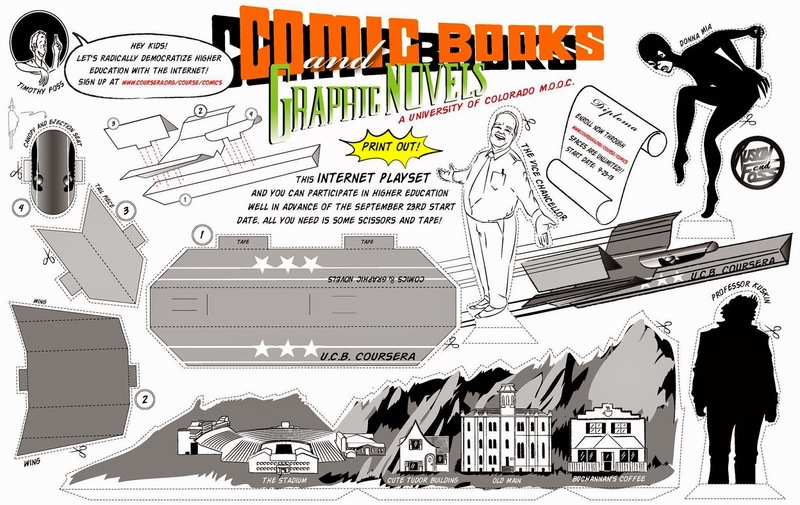 The course I chose was called "Comic Book and Graphic Novels", it was offered from the University of Colorado Boulder and the professor was Mr. William Kuskin who was passionate about comic books and his favourite phrase was ''Onwards!". It consisted of weekly online lectures in which the professor analysed comic book pages and talked about the history of comics and multiple choice quizzes. This was the easy part. In order to complete the course successfully I had also to a) write two papers in English (my native language is Greek, so why do you write this blog in English you ask, a good question I reply), b) create a four-page comic with a cover, art and story, all mine and c) evaluate papers and comics of other students. I had some general ideas for the comic but my drawing ability was limited. I began sketching and trying to write a short story with dialogues. I chose two characters and a near futuristic, kinda sci-fi theme. Page by page the project came to life and it was completed before the due date. The title of my story is "Abducted" and you can feast your eyes upon it here. All rights are reserved although "Piece of Moon Comics" do not exist in real life. Yet. The course is offered for a second time this September. I fully recommend it to anyone who wants to have fun, learn interesting facts about comics and graphic novels, discover their importance and create something of his or her own. The whole experience of the course was great and that was due to the professor and the people of the University and Coursera but mostly due to the enthusiasm of my fellow classmates. Thanks! I enjoyed it. If only I could draw better.